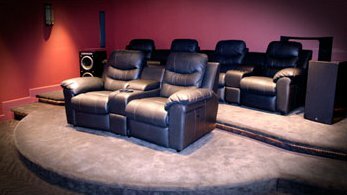 A personalized Home Theater system designed and built by TheExperts offers the magic and excitement of big screen cinema, right in the comfort of your own home. 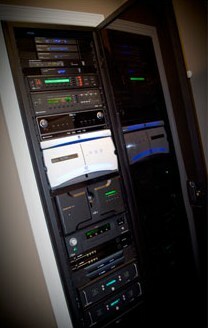 Add to that a custom-designed control system to ensure your home theater is as easy to use as it is enjoyable. For the ultimate theater experience, TheExperts utilizes ultra high-definition 4K projectors with the latest digital imaging technology including LED and Laser. These projectors offer far superior clarity, brightness, and contrast. A beautiful HD picture is only half the experience. High-definition multi-channel surround sound is what creates that immersive environment which makes us feel like we are living the movie, rather than just watching it. To ensure that your new Audio & Video components perform to their maximum potential, TheExperts can expertly install acoustical room treatments and automated lighting control. These are the finishing touches on a truly awe-inspiring Home Theater. Also known as “multi-room A/V”, distributed audio/video allows you to enjoy a variety of entertainment options throughout your entire home or office. Sources can include streaming media such as Sonos, Pandora, Spotify, and Rhapsody, or even your own music collection stored on a smartphone or home PC. Easily control the whole system using an intuitive in-wall touch-screen, or from the comfort of your sofa or poolside lounge using a smartphone or tablet! Did you know you can safely install a high-definition audio / video system outdoors? TheExperts have the knowledge and experience to transform your outdoor living area to a central entertainment hub. Maybe you’d like some music for your next pool party. Not just a portable stereo, but the great sound quality you get from your living room system. Or maybe you want to watch the big game during your next backyard barbecue. 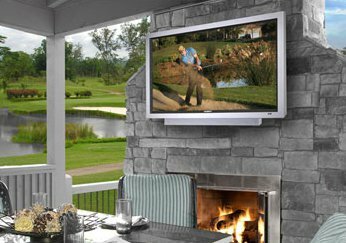 We can outfit your outdoors with the ultimate entertainment system. High-definition television and movies, digital surround sound…. the sky’s the limit! There are some unique challenges to designing an outdoor entertainment system. As experts in outdoor audio / video installation we know how to overcome these challenges. Moisture: Based in Florida, we’re no strangers to rain and humidity. We select moisture resistant, sealed televisions and waterproof speakers if necessary. Visibility: Your outdoor television may look great when the big game starts, but what happens just a few hours later when the sun’s rays are sneaking below your outdoor covering? This is just one unique challenge we take into consideration during the design. Safety: Outdoor electric installations have different local code requirements than indoor. We know these requirements inside and out. Sound: The sound coming from your system dissipates quickly when there are no walls. We plan speaker placement so that sound is disbursed evenly so everyone can hear it without being overwhelming for some.